Turf Drain™ is the flagship product of Turf Drainage Company of America. Turf Drain was the first “waffle drain” introduced to the golf course industry at the 1985 GCSAA conference in San Francisco. Turf Drain can be used anywhere you would use perforated pipe. 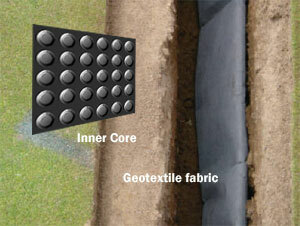 Turf Drain consists of two components; an outer geotextile fabric wrapped around an inner core. The unique core design provides a greater collection area for water to enter the flow area than is possible with perforated pipe. Turf Drain has been used on the finest courses in America in all applications, including greens, fairways, and bunkers.